The Jester King Brewery just West of Austin is one of the best places to enjoy a Texas beer in the outdoors. And as more and more breweries begin to open separate taprooms and expand their serving hours, craft beers fans won’t be limited to a packed Saturday afternoon tour when they want to stop by and sample new or specialty beers straight from the source. But if you’ve hit up all your neighborhood breweries, e.g. 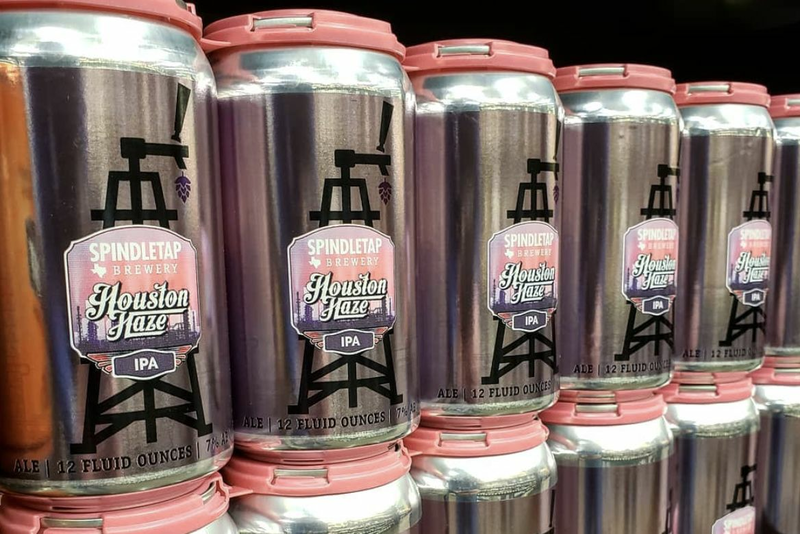 Saint Arnold’s and Karbach, and can recite the tour spiel from memory, it may be time to branch out to some of Texas’ destination breweries. After all, it’s a great big state, and there’s a lot to do and even more beer to drink. Breweries, by nature, have a very industrial look. They require a lot of metal, concrete flooring and machinery. But who’s to say that they can’t also be rustic and charming? Jester King is an authentic farmhouse brewery located in Ceres Park, 200 acres of preserved Texas Hill Country just outside of the Austin city limits, and resembles the Old World breweries from which they draw inspiration for their beers. There’s not too much around the brewery itself, but if you go when the weather is nice, it’s hard to think of a reason why you’d want to leave. 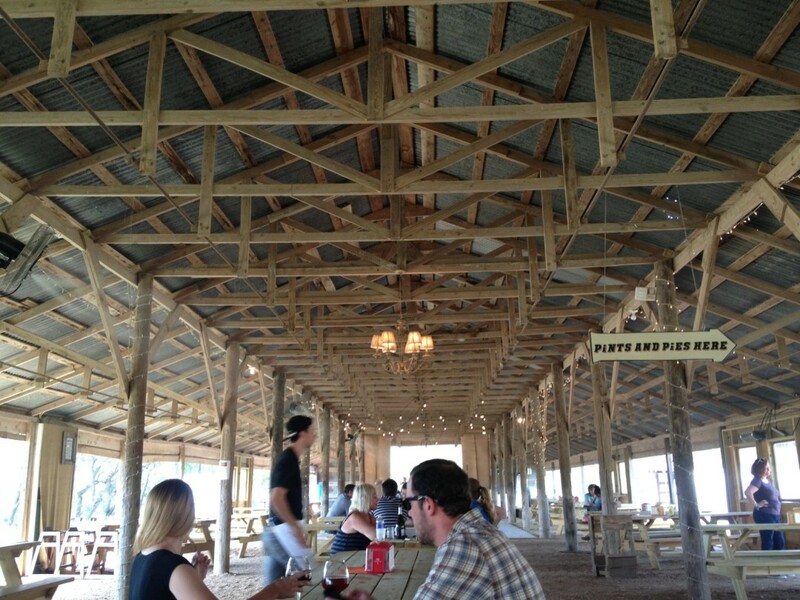 The open land surrounding the brewery for your dogs/children to run around in, the picnic tables under a huge porch, the beautiful glassware, the pizza… Yes, in addition to the beer and scenery, you can also order lunch at Stanley’s Farmhouse Pizza, literally steps away from the brewhouse. However, be prepared to wait in line if you go on a day when a new beer is released. Jester King fans from far and wide have been known to make pilgrimages to the brewery in the hopes of getting their hands on a bottle of Atrial Rubicite or Provenance. And if you think you know everything there is to know about brewing craft beer, do yourself a favor and take the tour at Jester King, where you’ll learn how their beers are naturally conditioned and made with wild local yeasts. It’ll make you think differently about how your favorite beers get made. 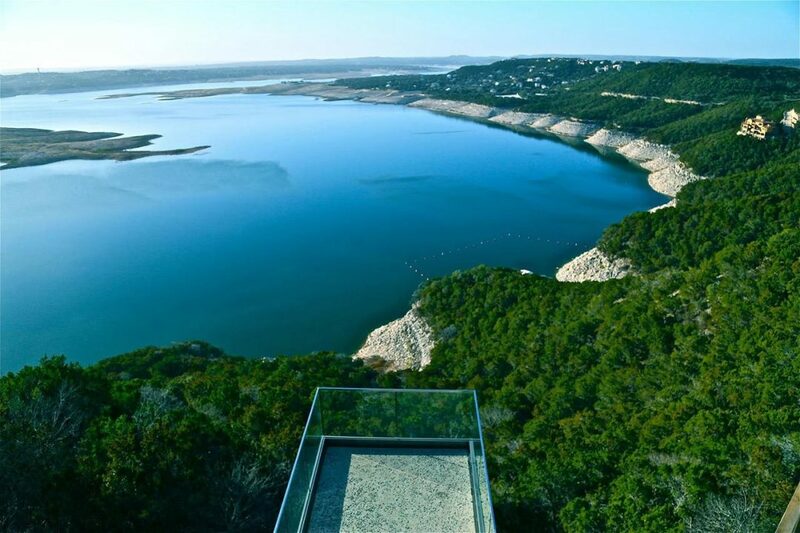 IMAGE: Oasis Texas Brewing Co. — The views of Lake Travis from Oasis' elevated patio make for some truly spectacular scenery while you drink. But if farmhouses and sour ales aren’t your idea of knocking back some beers on the weekend, you can always head up north for some traditional brews and a day at the lake. Oasis Texas Brewing Company opened earlier this year in the space previously occupied by Uncle Billy’s Brew & Que on the shoreline of Lake Travis. The barbecue may be gone, but Oasis has kept the passion for brewing beer and the stunning waterside views. If you’re lucky enough to find a seat on a busy weekend, you can grab a beer from their outdoor taps and take in the scenery from the third floor of the building. Oasis’ taproom is open Thursday through Sunday, serving the kind of session beers suitable for a day near the lake. These beers may be lower in ABV (alcohol by volume), but they’re definitely a few steps up from the Bud Lights that are too often paired with water recreation. Their London Homesick Ale, an English-style bitter, recently took home a gold medal at the Great American Beer Festival in Denver. And if you get hungry and aren’t easily confused, you can headed over to The Oasis for dinner. Not to be confused with the brewery, The Oasis is a multi-story Tex-Mex restaurant perched on a hill at the western edge of Lake Travis. Most of the restaurant seating is outside, where you can experience The Oasis earn its slogan, “Sunset Capitol of Texas.” The restaurant also seats close to 2500 people, so getting a table on a Saturday night shouldn’t be too hard. IMAGE: Deep Ellum Brewing Co. — The backyard porch vibe pairs well with Deep Ellum's tasty beers and carefully designed pint glasses. Austin isn’t the only city that’s been affected by the craft beer boom. Dallas-Fort Worth has seen 14 new breweries open in the last 3 years alone, with no signs of slowing down yet. But while beer lovers in Dallas will never be short on places to drink on a Saturday afternoon, visitors should be warned: like many breweries, several of these new establishments are out of the way, with few dining or entertainment options nearby. 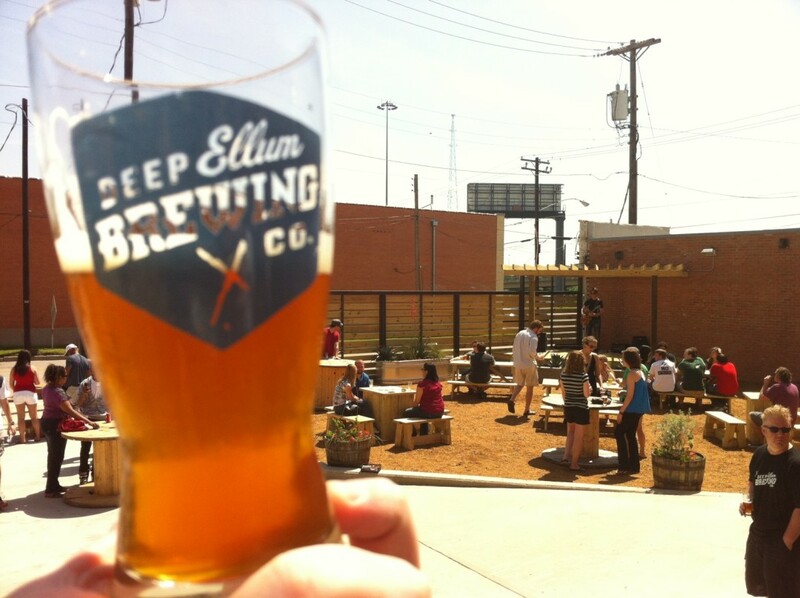 But if you’re looking to have a few beers outside and maybe soak up a little culture at the same time, Deep Ellum Brewing Co. can help you out. 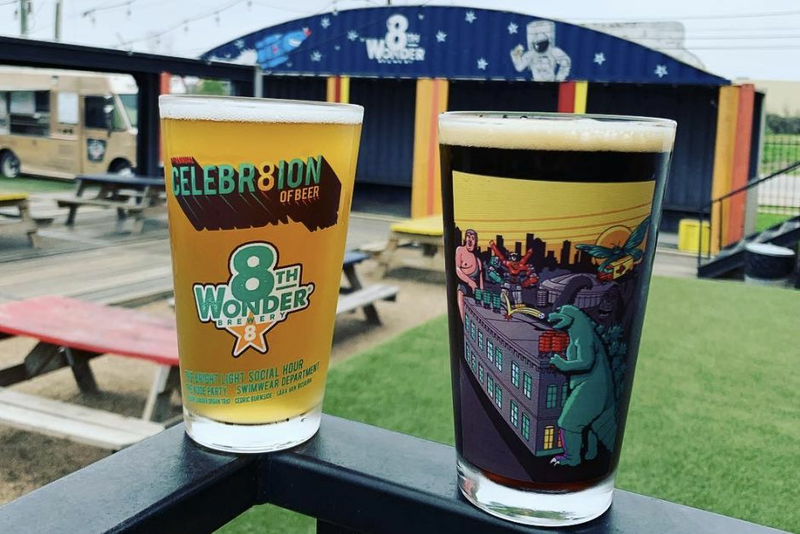 Located on the outskirts of downtown Dallas, DEBC has recently opened up their own separate taproom, which is open daily and serves beers that can only be found on-site, holds hourly private brewery tours, and hosts a weekly open mike night. This is a great option if you want to skip their Thursday or Saturday tours (which, at $15 for admission, are a bit on the pricey side), or if you just want to pop in to try their famed Deep Ellum IPA. But perhaps just as important as the beer is it’s namesake. Deep Ellum, once a popular entertainment district in the 90’s, and decades before that, a jazz haven, is back on the upswing. The blocks of abandoned commercial storefronts are slowly being leased to new businesses, bringing back the art, music, and food needed to resuscitate the area. 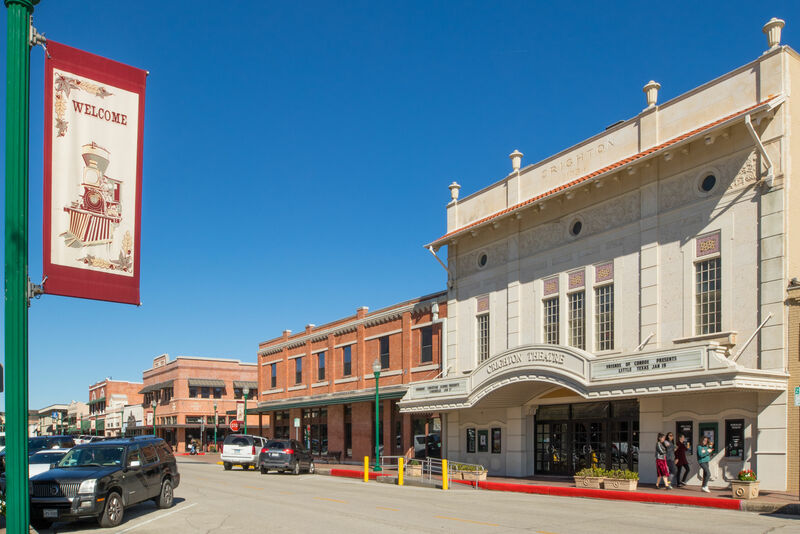 DEBC is located within walking distance to bars, shops, art galleries, and restaurants (including the BBQ mecca, Pecan Lodge, which moved from a stand at the nearby Dallas Farmer’s Market to a brick and mortar operation in earlier this year). Deep Ellum is also a great place to walk around — during the day, at least; it’s still a bit intimidating come nightfall — Outdoor marketplaces can often be found on Saturday afternoons, and Dallas has embraced the graffiti that once plagued the neighborhood by commissioning artists to cover buildings with murals. So don’t forget to have your photo taken with the Deep Ellum sign featuring Chuck Norris, the Dirk Nowitzki mural, or my personal favorite, the old TV with the robot and T-Rex on Good Latimer.